Los Angeles may be the hub of the entertainment world and one of the newest cities in America, but we still have plenty of history to share! Just north of Dodger Stadium and Downtown Los Angeles sits the Heritage Square Museum — a living history museum highlighting life in Southern California in its first 100 years as a state. The property has plenty to see with actual structures from the Victorian era that have been saved, preserved, and moved to the location. The structures offer up a picturesque 1800’s town just 2 miles away from the skyscrapers of Downtown Los Angeles. Living museum, you ask? Yes! 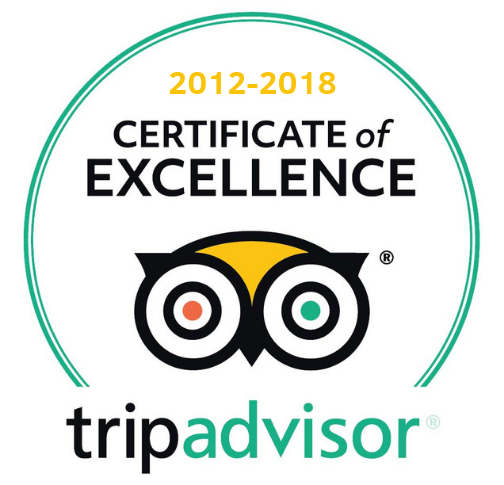 The museum staff are working, acting, and living as if they were back at the turn of the century, interacting and teaching the guests all about life as the state grew and developed. Obviously with Halloween right around the corner they have to do something to highlight this festive time of year. On the 27th and 28th of October, the museum will be highlighting the history of the state’s early Halloweens as well as the mourning process after a loved one passed in the Victorian era. For those of you who love a little bit of a creepy or spooky feel, you can attend a funeral held inside one of the site’s historic homes, learn about the Spiritualism movement, and get your fortune told! Kids will have plenty to do as well, as the museum touts games for them to play from the era, crafts, and a good old story time with some stories to spook them just a little (they promise to make sure they will be able to fall asleep at night!). The event takes place on Saturday October 27th and Sunday October 28th, 2018. Children 6 and under get in free, and adults can get tickets for $20, seniors for $15, and children ages 6-12 for $8. Check it out and get your tickets at the Heritage Square Museum Halloween official website. 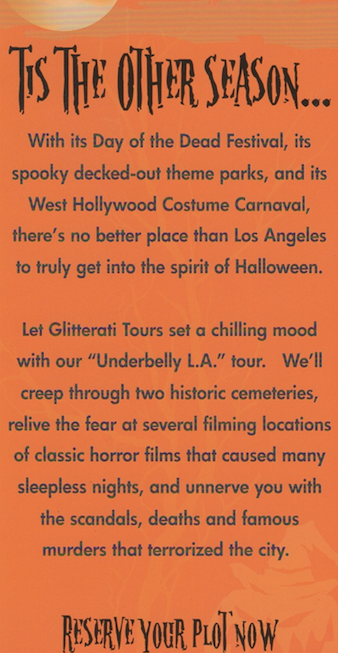 If you’ll be up in the Hollywood or Beverly Hills, Glitterati Tours is conducting our most popular tour this time of year. 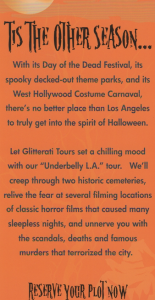 It’s our Underbelly L.A. Tour, which is our celebrity homes tour, but with a heavy emphasis on the darker side of our city. This includes the scandals, murders, suicides, prostitution arrests, O.D.’s, drunk driving arrests…and even a legendary cemetery or two!